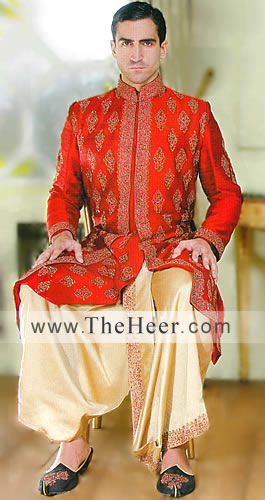 Red sherwani having rich embellishments on collar, front, hem and cuffs. Medium-sized ornamental motifs also spread across the sherwani. Comes with inners as Kurta, Shalwar / churidar pajama.Made in Pakistan. Click the button below to add the SW703 Red Jamawar Sherwani to your wish list.